Club Penguin Cheats by Mimo777 Club Penguin Cheats by Mimo777: Mimo's Club Penguin STAMPede Party Pictures! 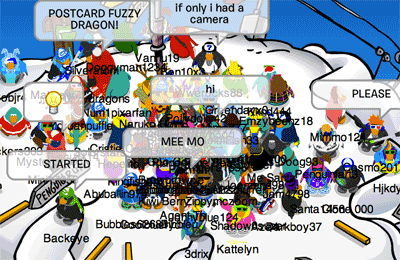 It was probably only of the greatest Club Penguin Parties in the history of Mimo! 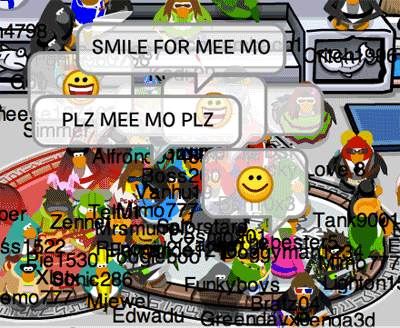 It was probably one of the best Mimo Parties in the history of Club Penguin! Anyways, we rocked out in a bunch of rooms. 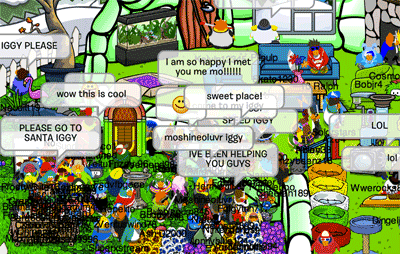 Then we rock out a bunch of Igloos! Check it out! Then we all said good bye and went to bed. We will definitely do that again! Were you there? Did you like it? Make sure to follow me on Twitter so you can get the next clues! wow , i saw my penguin in the pictures a couple of times(: woot ! That was really a fun party! I hope you have another! Oh.. Sorry I didn't make it.. I was at Screenhog's party! 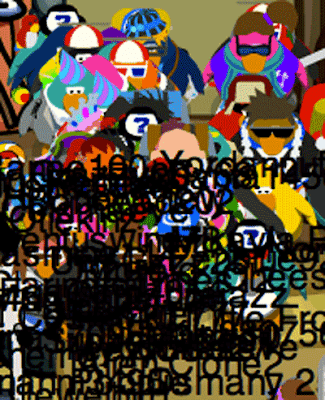 can you have another stampede party cause i didnt know what sever but i was on north pole and didnt see screenhog either...as i said in my last comment. and what time would it have been in the usa? at 8:00 penguin standard time? i was there... and im in every single picture!!! woot woot! it was the most awesomest party ever! well the only thing was we didnt visit my iggy. :( *sigh* maybe next time? although i was in some of the picture! No i wasn't there it was 11 o'clock here I am on the east coast of the US. I'm in four pictures! haha! That party was so fun, Mimo. I hope you have another one soon! It was the best party ever! Everyone had fun. 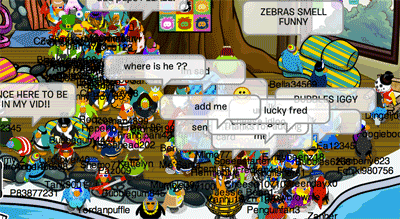 Thanks for coming to my igloo! i really needed that stamp and u helped me! I hope u have another party soon! That was a great party Mimo! I ahd alot of fun getting lots of stamps! I hope we can have another similer party soon! It was awesome! I got my Drill on the Ice Berg with 30 penguins Stamp. 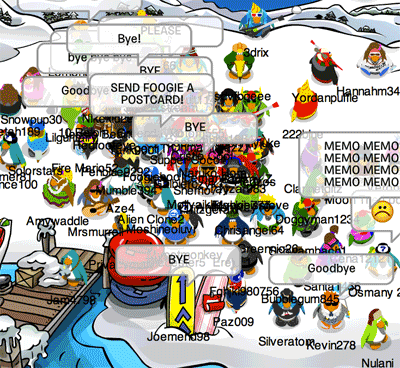 And got both igloo party Stamps. Thanks Mimo! Now I just have 1 more stamp, Complete Survival Mode Stamp... Gotta work really hard for that one. You had a TON of penguins dressed like you! LOL! 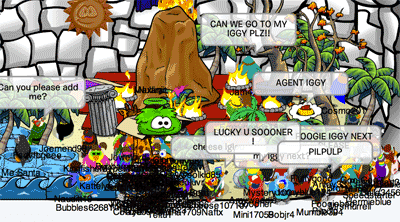 Oh and THANKS for coming to my iggy! That made my day! :D You ROCK for that! Oh, maybe next time you can make it. Cool. I didn't get in many of them cause it was so full. lol. And I shared with my friend, we were switching. Me too. It was awesome. The server went from one bar to three bars in like five minutes. Oh, Mimo gave away the server as soon as the party started. I think he will have another one soon. Yea, 8:00 PM PST it started. But theres different time zones in the USA. It was at 11:00 PM for me. But I stay up late all the time so 11:00 was nothing to me. Last night I made it till 4:30 AM. Sweet. You must of got around fast. Almost everytime I was trying to get to the room Mimo was in it was so full. lol. But I still had a great time and got some Stamps. How about you? What Stamps did you get? its ok though..anyways atleast im in the last pic :D maybe even some others! I was there. Infact I'm hidden in a few of the pictures. but only in one of them am I clear. I'm iceman4899. I have a parka a beard and a red cap (which makes me stand out). in that picture you can see a bit of my name. yay I was at the best mimo party ever! Thanks for having this party I got four stamps! oh come on... i missed it... again! i went to a party :-( i want another at 8:00 pst (east 8:00 in us and west in us 6:00) sorry cuz i dont know any other in other eastern and western continents. and place or server beanie or deep snow. USA has a bunch of time zones. That Party looks so fun! I know why you said. 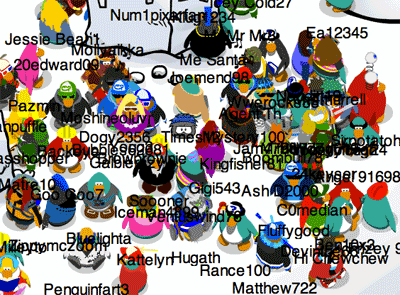 Because I think Screenhogs party had more penguins than your Stampeed Party. I would of loved to go. Whenever I see details for a party. I didn't go because I was at my friends house on a sleepover. It looked cool. Sorry I missed it! Awww, too bad. It looked really cool. Some time could you do it 12pm cp time? that would be cool! I didn't make it but it sounded cool! LOL i saw so much penguins who dressed up like mimo. i started to see it when someone had a green parrot instead of a red. U ROCK MIMO!! Mimo how many stamps do you have now? Wait.. wasn't Screenhog's party 12 hours before Mimo's? why does people call mimo me mo?? i just found this site and it was pretty good. I think he should have his own stamp. A "meet mimo" stamp. :D I wouldve got it. Or Mimo could have his own background! that stamp would rock!or backround! tell me when your next party is mimo!! 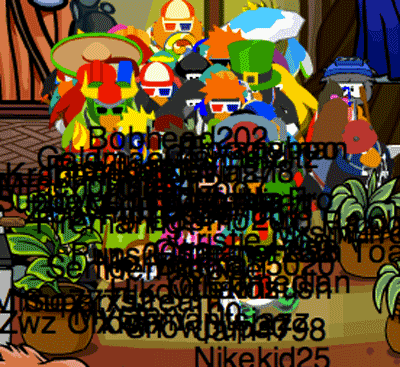 soon halfway through the photos the penguins started crowding each other together i could barely see the names, LOL XD. i have to say the parties are getting BIGGER AND BETTER! Hi Mimo I just wanted to say that i thought ur party was awesome ! i also wanted to know how come u didnt post any picss from my iggy. :( i was Amywaddle. Why where the calling Mimo mee mo? I know that that's how it's pronounced, but his real nickname is Mimo. It's so packed I can't even see you!! Why does everyone say Mee Mo or memo and now mimo? Why do people dress up as you? One of the best parties ever? You are just rubbing it in! I didn't get to go! Rofegme, Thanks for answering my question!